An innovative way to make saving and managing your everyday finances easier than ever. Only available on the award-winning1 to disclaimer RBC Mobile2 to disclaimer app. NOMI makes managing your day-to-day spending as simple as can be. So, while you’re out living your busy life, NOMI keeps an eye on your money and ensures you’re on the right financial track. Plus, NOMI Find & Save can even set money aside automatically to help you meet your financial goals even faster. NOMI helps you manage your everyday finances by providing you with timely and personalized trends, alerts and overviews based on your spending and saving habits. Summarizes your everyday banking activity across all your accounts – including credit cards! NOMI knows when the refund you made yesterday has finally been received or if your hydro bill will be coming in higher than usual this month. Let you know when there has been new or unusual activity. Remember that gym membership auto-renewal you signed up for? Well NOMI knows that, and will even notify you if they’ve increased your fees this year. Categorize your spending, with easy-to-understand overviews and deep dives to help you stay on the right financial track. Using predictive technology, NOMI Find & Save does all the work for you, so you can save money without lifting a finger. 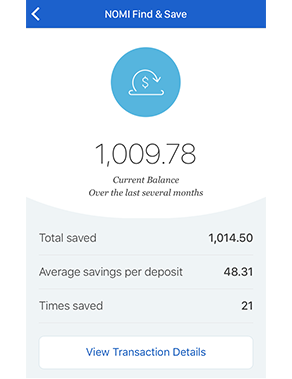 Saving made easy – and it’s free! NOMI Find & Save will learn your transaction patterns, find those extra dollars that we think you won’t miss, and then set them aside for you automatically. Always stay up-to-date. We’ll notify you when transfers occur so you’re always informed. Access your money anytime through free transfer to your source chequing account. NOMI finds and you save - it’s that simple! Turn on NOMI Find & Save in the RBC Mobile App. NOMI Budgets helps you manage your money by taking the thinking — and the manual calculator work — out of setting up your budget. Takes a close look at your spending and recommends a personalized monthly budget that’s based on your habits. Zeroes in on 5 categories, helping you manage how much you spend on transportation, shopping, dining, entertainment, and cash withdrawals. Keeps you on track by sending you regular updates, or take a quick glance within the budget tracker to see how you’re doing for the month. Over? Under? On track? You’ll always be in the know. Where can I find NOMI Insights? 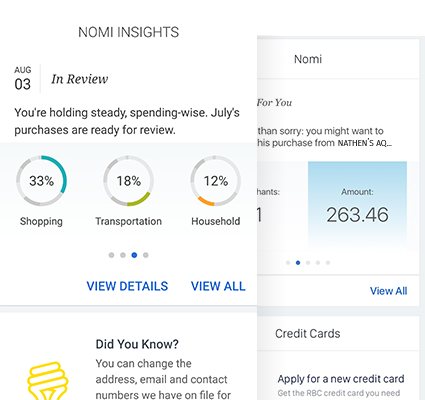 NOMI Insights is available on the home screen of the RBC Mobile app for Android and iOS. You don’t need to do anything except download or update to the latest version of the RBC Mobile app. You will see the insights as long as you’ve been using your chequing, savings and/or credit card accounts for the past three months. How do I sign up for NOMI Find & Save? NOMI Find & Save is available to clients with a Canadian, personal Chequing account. Simply sign in to RBC Mobile, tap More and then tap NOMI Find & Save. Can I pause NOMI Find & Save if I need to? Of course! You have the ability to pause and resume NOMI Find & Save at any time. To pause and resume, access the NOMI Find & Save settings in the RBC Mobile app. Tap your NOMI Find & Save account, then Settings. From there you can tap or swipe the toggle button to turn on the Pause feature. You can also select a date for when you would like NOMI Find & Save to resume automatically. What happens to my personal banking details? 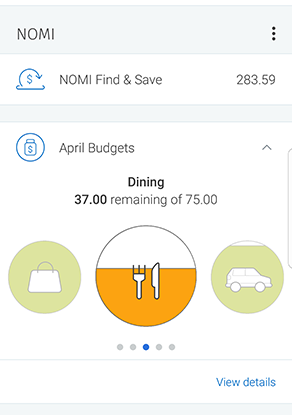 NOMI collects and uses your information to provide personalized, timely and relevant tips, cues and advice to help you manage day-to-day finances through the RBC Mobile app by using specific algorithms to create your insights. Your details are never shared with anyone or used for any other reason beyond providing you with your personal insights. Should something ever happen, we will fully reimburse you for any unauthorized transactions made through the RBC Mobile app or RBC Online Banking. At RBC, we are dedicated to protecting your privacy and safeguarding your information and accounts. Your insights are never shared and are for your personal use only. The RBC Mobile app was awarded the ‘Highest in Customer Satisfaction Among Canadian Mobile Banking Apps’ in the J.D. Power 2018 Canadian Mobile Banking App study1 to disclaimer. Explore NOMI on the RBC Mobile app today! An innovative way to help make your everyday banking a little bit easier to manage and understand. iPhone, iPad, and iOS are trademarks of Apple Inc., registered in the U.S and other countries. App Store is a service mark of Apple Inc.
Android and Google Play are trademarks of Google Inc. Samsung Galaxy S III and Samsung Galaxy S4 are trademarks of Samsung Electronics Canada, Inc. and/or its related entities used with permission. RBC Royal Bank received the highest score in the 2017-2018 Canadian Banking App Satisfaction Studies and among Big Five Retail Banks in the 2016-2018 Canadian Retail Banking Satisfaction Studies of customers’ satisfaction. Visit jdpower.com/awards. RBC Mobile and RBC Online Banking are operated by Royal Bank of Canada, RBC Direct Investing Inc. and RBC Dominion Securities Inc.